baby meets city: can you see your shadow? There's an innovative piece of theater for the 2-5 year old set happening on Saturdays this month on the Lower East Side. The Trusty Sidekick Theater Company presents "Shadow Play," which is back after a sold-out run last year. Performed at the University Settlement on Eldridge Street, the play centers around a boy and his shadow... and a whole lot more! When you enter the theater, children are encouraged to sit in front and there are seats for parents in the back. I wasn't sure what to think at first, as the only items on stage were rather dull cardboard boxes in odd shapes and sizes. As the show began, the main character (and the only one aside from his shadow), Flash, picks up this box and that one, stacking and sorting them around, only to create a sofa, TV, lamp, telescope, etc... and before our eyes the stage changes from a bunch of boxes to Flash's home. Really neat! As the play progresses, Flash encounters his shadow and the adventure begins, complete with a trip to the moon. With animation, live action and lots of laughs, everyone will enjoy "Shadow Play," not just your little ones. Afterwards, kids are encouraged to get up and dance and go find their own shadow. Millie was about the 3rd kid who got up and started dancing (which I kind of love about her). Next up for the Trusty Sidekick is a production of "Off the Map," about a subway car that makes an unexpected detour. Sounds like a ride for the whole family! If you're looking for a way to introduce your child to the world of theater, this is a great way to do it. And with a running time of about 30 minutes, your child doesn't have a chance to get antsy, either. Believe me when I say I know how important that is! 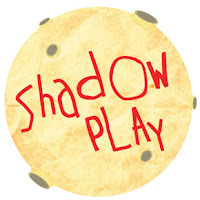 Click here to purchase tickets for "Shadow Play." Disclaimer: I was provided with tickets to attend "Shadow Play." All opinions expressed herein are my own.